Tet is just around the corner! To the Vietnamese, Tet (A.K.A Lunar New Year) is as important as Christmas is to Westerners. Tet is just around the corner! To the Vietnamese, Tet (A.K.A Lunar New Year) is as important as Christmas is to Westerners. However, because Tet is a family holiday, many people will leave the big city like Saigon to return to their hometown for a reunion. As a result, many restaurants, shopping malls, and attractions will be closed during Tet. So what can you do on Lunar New Year? 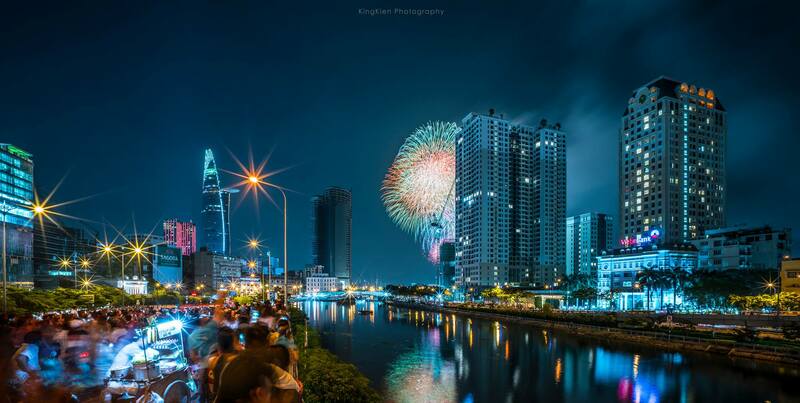 This article will show you how to celebrate Tet in Saigon like the Saigonese do. Together with many other Asian countries, Vietnam celebrates the Lunar New Year (in Vietnamese Tet Nguyen Dan or Tet Ta), around January or February. In 2018, the first day of the year falls on February 16th. Just like Christmas, on this holiday those who move out and live separately from the family will come back home for a reunion after a busy year. 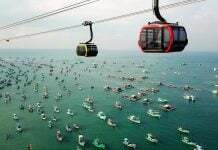 Due to this, during the first week of Tet, big cities like Saigon or Hanoi will be almost empty. Let’s talk about the stages of Tet! Tet can be divided into 3 stages: before Tet, Tet’s Eve, and the 3 days of Tet. In this stage, family members will spend time cleaning up and re-decorating their homes. Some families will even repaint their whole house to bring luck to the owner. The new year is a good time for a fresh beginning. People often throw away old stuff that is no longer used or things that may bring bad luck to the family. Two weeks before Tet is shopping time! People look for new home appliances, decorative items, flowers, red envelopes, sweet treats, and gifts for their business partner or relatives and friends. Don’t freak out when you see endless lines of people waiting for their turn to check out in the supermarkets. If you have time to wander around Cach Mang Thang Tam street in Tan Binh district, you will feel the bustling atmosphere of Tet in Saigon. Tet’s song will play in the huge speakers in front of countless fashion shops. On the side roads, the traders sit on the street to sell dong leaves (a leaf used to wrap the sticky rice cake, the traditional dish of Tet Nguyen Dan). In addition, many temporary markets (like the floating market in district 8) will be open only for Tet holiday. You should spend a couple hours there and check it out. We visit each other’s house on Lunar New Year, and because of that, we always spare a table to display dried candied fruits, roasted watermelon and pumpkin seeds, cans of beer, soft drink, tea, and watermelon. When the guests come, we will have delicious treats to offer them. Another signature sign of Tet that you will see on the days leading up to the holiday, is the motorbike-taxies carrying yellow apricot flowers (the symbol of Tet in Vietnam) and kumquat tree. Many Vietnamese families have a small shrine in their kitchen to worship the Kitchen God. The Kitchen God will keep the stove fire going to heat the house, making it cozier and warmer for family members. The Kitchen God will also record the behaviors of people who live in the house. Then, they report the list of good and bad things people have done to Jade Emperor once a year, on the 23rd of December (Lunar Calendar). The Vietnamese will make boiled carp, fruit, some other dishes such as Chung cake, Tet cake, and burn incense as offerings to send the Kitchen God on his journey to heaven on this day. Did you know that the lunar calendar only has 29 to 30 days? That’s why we call the last day of the year 29 or 30 Tet, depending on how many days are in the month. This also refers to reunion day. 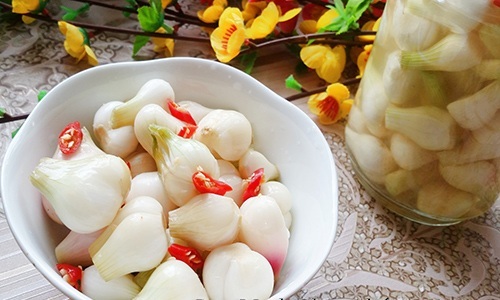 In the morning, we will prepare many traditional dishes such as pork braised with duck egg in coconut juice (thit kho hot vit), boiled chicken, Tet’s cake, and so on. There are also 5 types of fruit including custard apple, coconut, papaya, mango, and watermelon (also known as one of the symbols of Tet) that we also prepare. These are the offerings to our ancestors, Kitchen God and the homeless souls. Then the family members will gather together for lunch or dinner and share our stories of what we have achieved throughout the year, as well as our plan for the new year. At midnight, when the fireworks light up the sky, it’s the sign of the New Year. “Xong dat” is a special custom that only happens on this day. After the fireworks are shot into the sky, and the new year officially starts, a person is chosen by the family to be the first one to walk through the door of the house. The Vietnamese believe that it is necessary to find someone with a zodiac animal that matches the house owner’s, so that he or she will bring luck to the whole family. The “chosen one” is also required to have a generous, happy, and positive personality. Don’t sweep the floor. It’s believed that this action will also sweep your money away. Don’t break anything. This can mean some relationships will be broken in the new year. Don’t get involved in any argument. To maintain harmony in the family, on this day, people stay away from fighting with each other or yelling at the kids. Don’t borrow another person’s money. This will bring bad financial luck to you both. Traditionally, this is when people visit their relatives or best friends’ house, and the married couple will visit the wife’s family. 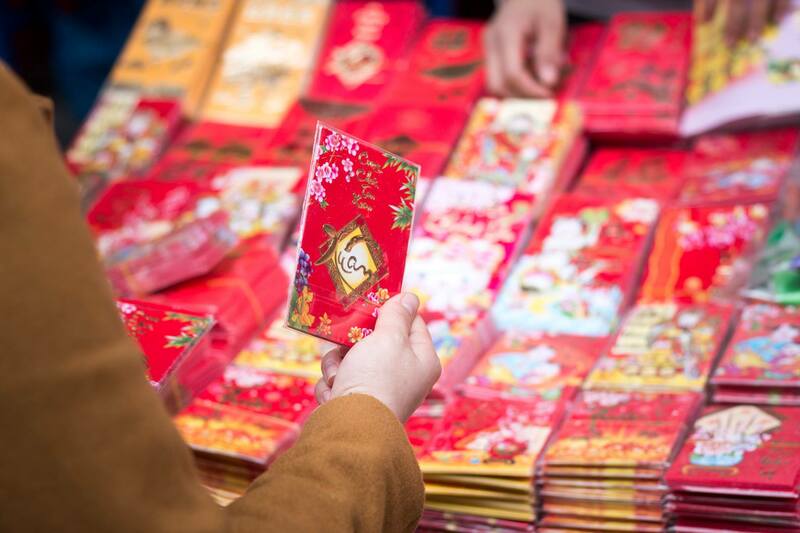 The kids will also receive red envelopes when they make wishes to the older people. Many families start traveling out of the city on this day or they will visit the neighbors’ houses, old teachers, and so on. In the evening, another offering will be made to the ancestors, it’s time for the souls to return to heaven. Although Tet only spans the first part of the year, the repercussions of your actions last for at least a month. The fourth day of Tet is believed to be a beautiful day to re-launch businesses. Therefore, many places will reopen and people will slowly go back to normal life. 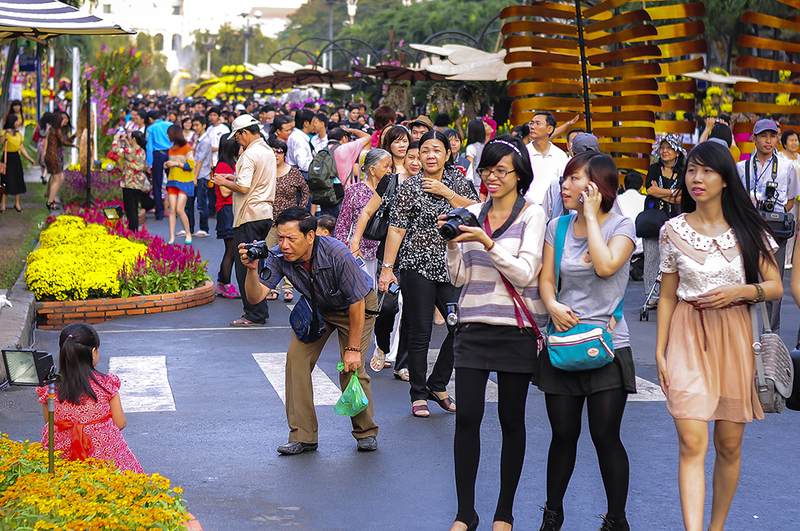 If you arrive to Saigon during the holiday, where should you go? 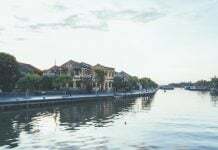 Where to go on Tet Holiday in HCMC? Tet is the only time of the year when you can see a floating flower market in HCMC. Every year around the 25th of December, many traders from the southeast of Vietnam bring their products to Ben Binh Dong in district 8 and form a seasonal flower market. From the banks to the canal, thanks to the trading activities, life on the river bank is lively and exciting. Many boats displaying tons of colorful flowers, beautiful plants, and juicy watermelons line up at Tau Hu Canal. This is a beautiful sight for those of you who love photography. Don’t hesitate to make it a MUST VISIT place on your to-do list. *The floating flower market only lasts from December 25th – 30th in the Lunar calendar (January 30th, 2018 – Feb 4th, 2019 in the normal calendar). It would be a mistake to skip the ornament streets located in the heart of Chinatown. While Westerners find joy in decorating Christmas trees, Vietnamese love adding ornamentation to yellow apricot flowers on Tet holiday. Most Saigonese will go to Hai Thuong Lan Ong street in D5 to shop for these ornaments. There are numerous shops next to each other with the same business model: to sell seasonal decorative items. Since the color red is the theme of Tet, almost everything displayed comes in this shade. From Chinese lanterns to silk flowers and handheld confetti cannons, you can find it all here! 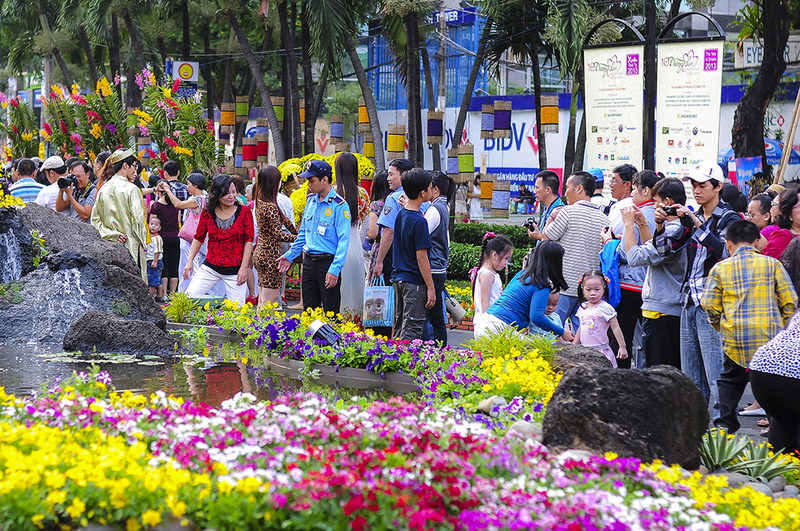 Nguyen Hue Boulevard will blossom with many types of flowers such as yellow apricot flower, daisy, hollyhock mallow, orchids, hydrangea, lotus, and so much more. This year, the street flowers will open for visitors in the evening of February 2nd. Since this is the year of the pig, the cute piggies will become the mascot of the 2019 flower street. This street is also a book street! So there is something for everyone on this new year. * The flower street is held from 7 PM February 2nd to 10 PM, February 8th. The poetic view of Phu My Hung attracts more than 1.5-million visitors every year on Tet holiday. This year, the decorative theme of Phu My Hung flower fair is the famous flower market in Dong Thap. In the evening, the Starlight bridge will be lit up, making the place even more graceful! Another place where you can enjoy the grace and splendor of the flowers is Tao Dan Park. This location is not as crowded as the two spots mentioned above. Here you can find different types of flowers, plants, and bonsai. Furthermore, you can listen to the song of the birds here. However, you must pay a small entrance fee. Dam Sen or Suoi Tien park are good places to check out if you visit HCMC during Tet holiday. While Suoi Tien has a fruit festival every year, Dam Sen offers a street carnival. You can also have a new year picnic here! Entrance ticket: Please have a look here! In addition to places to go, food is another important part of this special holiday! What to Eat on Lunar New Year? You won’t starve in Saigon! Though most of the businesses are closed during Tet holiday, some restaurants will still be open to serve you. Address: Check out here for the nearest restaurant around you! Prepare a few red envelopes to give the children of the family. Normally, people put 50,000 VND or $2 USD in the envelope (because Vietnamese consider 2 dollars to be lucky money). However, you can also put the smallest bill of your currency in the envelope. 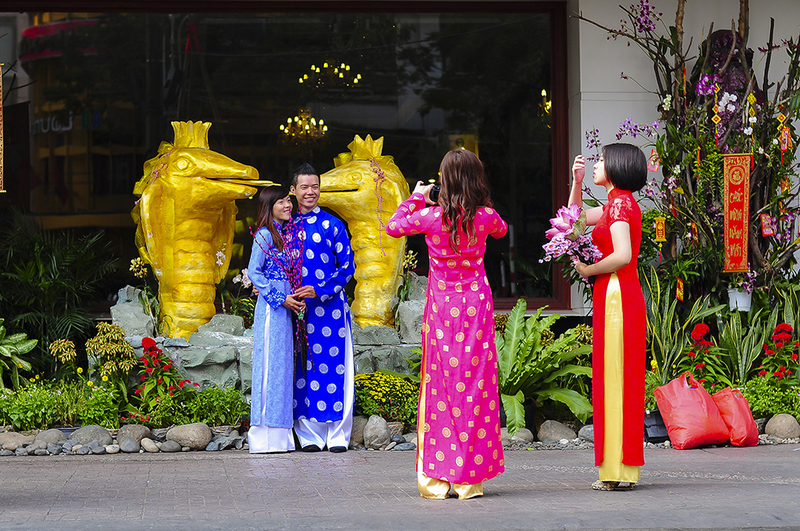 Dress up in Ao Dai or any piece of clothing that has a vibrant or bright color. White is acceptable to some families but avoid wearing black and dark colors. Bringing a gift basket or cards to give the head of the family is optional but you should do so to show your goodwill. If you make a wish to the family members or a friend, follow these simple rules: wish for health to the elderly, intelligence and happiness to the children, prosperity and luck to the rest. Receive lucky money with both of your hands. This is how we show our respect to other people. Van su nhu y – Everything you wish will come true! A perfect Tet itinerary made just for you! We’ve gone through all the trouble and mapped out how you can spend your days while visiting Saigon during Tet. Just follow the itinerary, and you’ll have a great time in the city and experience it like you should. This itinerary has three options of travel styles for each day, and activities will change depending on the type of travel you prefer, whether you’re adventurous or looking for a more laid-back relaxing time. We hope you enjoy our city. Don’t hesitate to contact van.bui@christinas.vn if you wish to edit your own schedule. She will help you personalize it. I hope this article will give you some ideas about what to do, eat, and say on Tet holiday in HCMC. 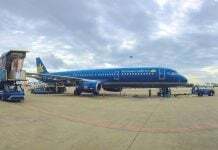 For a more guides to Tet holiday in Vietnam please click here for Nha Trang, here for Hue – Da Nang – Hoi An, and here for Da Lat. If you are heading to Hanoi, here is the guide to Tet holiday in Hanoi! Have a wonderful time in Vietnam! Chuc mung nam moi! Thanks so much for this! It is such a big help! I’m glad. I hope you have had a wonderful time. I’m happy that you found my blog helpful. How was your visit my dear? Very grateful for this post, it is so helpful!